I do have an outofmemoryexception in my app. Since the device has 256MB I have no idea why this happens. During execution there are only about 20MB used. So I wrote a little app pretty much like yours. Eating 1MB each loop I get an exception when i==25- but there ist still over 100MB available. Any idea whats going on here? What device are you running on? there is as max limit on pre WM 6.1 of a 32 meg per process. I was wondering if you are able to suggest how the thresholds can be changed. 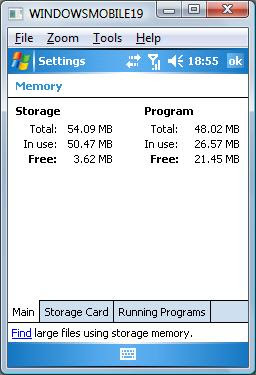 My 64MB device seems to call WM_HIBERNATE at 10MB free which can be quite painful when listening to music + browsing for instance - WMP will always get killed. Any suggestions would be great. I have a WM6.1 application .netcf vb which needs to incorporate memory management as you have described. Is your example code available in vb? I am based in London and wonder if you could review my entire code (for a fee ofcourse) to improve its performance. The app freezes up after a while presumably due to low memory. Sorry for the major late reply. I don't think the WM_HIBERNATE message threshold can be changed. It sound slike you have hit the threshold of 32-meg per process. Use the Remote Performance Monitor tool to check what your application is doing. Thanks for this code snipet. I know about this message, but the article was about getting the developer to understand what WM_HIBERNATE actually means and how to handle it. So a good way to get an understanding to the reader is to show a real example. 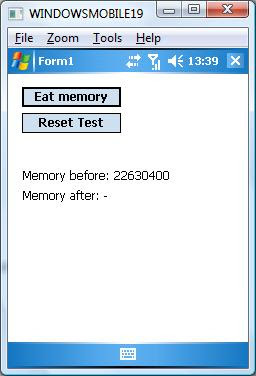 Hi is there a way to programatically retrieve the amount of memory taken in by a process on Window Mobile. 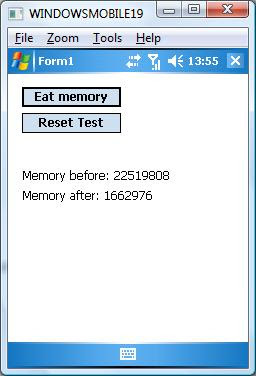 This is an easy task a normal Window computer but I've struggle all weekend to get a running process's memory comsuption count.